Writing a good CV and getting it right the first time will mean the difference between getting offers for an interview or rejection after rejection. If you feel that you meet the candidate specification for the role but you’re not getting interviews, it could just be that your CV needs more work. Fortunately, we’re here to help with our guide on how to write a CV! When it comes to writing a CV, much has changed over the past few years. With the abundance of online resources at the touch of a button, finding CV writing help has never been easier. This is the good news – so what’s the catch? The catch is that the quality of CV applications has risen dramatically. With so many fantastic CVs to choose from, the employer’s expectations have also risen along with it. Everything has to be perfect, from the CV template to the font you choose; from the layout and the spacing to the eye catching presentation. Simply, you can’t afford to get anything wrong as there will be so many other candidates who will get it right! This guide will explain the process of creating a CV for 2019 with our top tips to help you land your dream job. This might seem a bit obvious – a work history, right? But when you read the definition of a ‘CV’, you’ll begin to realise that there is much more to it. So what is a CV and what should it achieve? Short for Curriculum Vitae, the CV is the standard way of contacting an employer to apply for a position that has become available. Essentially the CV showcases your skills and experience. It is a way to effectively sell yourself to a prospective employer. The CV is designed to show the employer that you have the skills, qualifications and experience that they’ve requested via the job advert. This combination of information tells the employer that you are the right job applicant for the position. In some cases you may also be required to attach a cover letter or complete an application form. This is another opportunity to spell out how you meet the job specification. Your current skill set and achievements to date should for the most part match the requests of the employer for them to consider you for an interview. Indeed, in some instances there may be mandatory requests which you must address. For more info on writing the perfect cover letter, see our article: ‘How to write a winning cover letter: what to include‘. Does your CV hit the mark? Try not to fall into the trap of using the title ‘Curriculum Vitae’ at the top of your CV, as this is no longer done in 2019. Instead, your name, professional title (if you have one) and contact details usually go right at the top. Make sure your name is a little bigger than other text used for the CV. This ensures it stands out so that you are more memorable. If you have any professional letters, you should include these after your name or just underneath in a smaller font. Your contact details do not have to be any larger than the font size you use for the rest of your CV. However, you may decide to use bold text for your email and mobile phone number. This ensures the employer has no difficulty seeing how to contact you! Wondering whether to include a CV photo? Read our article: Should I include a CV photo? A professional title would apply to someone qualified in a specific area – like a solicitor for example. If you do not have a professional title or you are considering a change in career, then you won’t have this – which isn’t a problem. If you do have a professional title, then you should always have it alongside your name. This is what employers expect and it would seem unusual if it wasn’t there. Finally, some people choose to include their digital profile handles in this section, such as LinkedIn and Twitter. If you are actively involved in your industry on such sites, this can give you a huge competitive advantage over other candidates. Your contact details are essential and you should state your address, email address and contact number. It’s worth noting that you should only use a professional email address and not something silly. For example, don’t use ‘darthvadar666@hotmail.com’ and instead use your name like this – ‘john.smith1977@gmail.com’. Although some bosses might find it funny to see that you’re a fan of Star Wars it could also backfire. You’d be surprised at how often CVs are rejected because of something trivial like this! Always use an email address that doesn’t attract a lot of spam – you don’t want an important reply to be lost amongst junk mail. It’s usually a good idea to create a new email address when job hunting so you don’t miss anything. This will also allow you to create a more professional-looking address. unless they have a direct relevance to the role. Generally, these factors have no bearing on whether or not you can do the job – and they only open you up to the risk of discrimination. The profile is a crucial aspect of CV writing as it tells the hiring manager in a few words why they should hire you! It is therefore one of the most important parts of your CV because it has the job of making that great first impression. Your profile should go underneath your contact details and is the first thing an employer reads. It needs to catch the attention of the reader immediately. Your profile should always be short and to the point, and doesn’t have to go into any further detail. 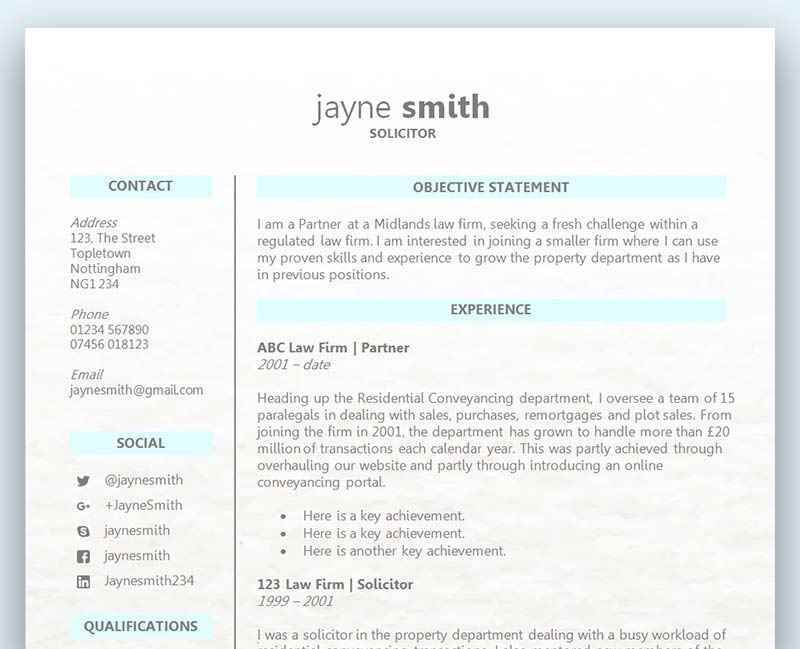 Above: An example of the personal profile in our ‘Slick Headers’ CV template – get the template here. This part of the CV is the most crucial aspect of CV writing. The standard way to complete this section of your CV is to list all of your previous job titles and respective duties. However, in 2019 employers no longer expect to see details of every single job that you’ve ever had. The correct way to complete this section now is to focus on the most relevant work experience. This should be listed in reverse chronological order starting with your most recent role. There is no need to go into any detail for these roles as this will only take up valuable space. The exception to this rule is if you have very little relevant work experience. You may then want to include jobs that are not relevant to the target position. Try to find aspects of the job which demonstrate skills that are transferable to the role you’re applying for. In addition to highlighting the recent and relevant roles you should also look to show the employer what you achieved. This might include any outstanding results (with stats), and how you made an impact during your time. The hiring manager is not only interested in what you did but also how you performed. This could be anything from the amount of revenue you generated, to an instance of how you dealt with a customer complaint. Showing promotions and how you achieved them is also a great way to impress the employer. Any internal and external awards should also be included, to further add weight to your career history. Don’t forget to use bullet points where possible and keep every sentence short and to the point. If you have a lot of information to include, proper spacing is crucial. Once you have everything on the page, take a step back and consider how easy it is to read. If you have any doubts ask a friend to check over it for you and have them give you their feedback on how it looks. A number of our templates have space to highlight exceptional achievements when writing your CV, such as the ‘Example’ template above: View and download it here. “Every experience in your life is being orchestrated to teach you something you need to know to move forward.” ~ Brian Tracy, Entrepreneur, Professional Speaker, Best Selling Author & Success Expert. Although this section might seem relatively straightforward, there are a few crucial points to consider. When completing the education section, lots of candidates will list their GCSEs, A-levels, college/university degrees, professional qualifications and so on. This list should again be in reverse chronological order. Further details should only be provided if relevant to the target role. Don’t forget to include the institution where the qualifications where achieved, along with the grade and the year. The types of qualifications and achievements can differ greatly from candidate to candidate. If you have many years of work experience or higher level qualifications, you may decide to leave off your earliest school qualifications and education unless they are relevant. You may also have picked up a few internal/industry training qualifications along the way. A mechanic for instance may have attended many courses over the years with a manufacturer like BMW. List these with further details of what has been taught during the course if you feel it would be helpful and relevant to the target employer. Sometimes employers also offer their own internal training, like managerial or marketing. Although this isn’t an actual accredited qualification it still may be something you want to include. This is particularly so if the training is relevant to the role you’re applying for. Such accolades show how you progressed within your previous role with your previous employer. By including such training you are demonstrating how you are always looking to progress your career, constantly learning new skills and staying focused on development. Sometimes including lower level qualifications may be beneficial where they relate to the position applied for. View and download the above ‘centred focus’ template. Underneath your qualifications in a standard CV. Ideally you want to use bullet points to highlight between 4 – 6 key skills that relate to the role you are applying for. This aspect of CV writing is sometimes ignored but it is critical! One of the best ways to identify the skills an employer is looking for is from the job advert. You want to try and phrase any matching skills you have as closely as possible to the job advert. This makes it easier for the hiring manager to tick one or all off of their list. Essentially a CV is a way to prove to the employer that you are the best person for the job by showcasing the right skills, qualifications and experience. The core skills section is a perfect example of how that can be done. You can achieve this by showcasing those 4 – 6 skills that relate to what the employer is looking for. You can further supercharge your CV by explaining WHY you have the skills claimed. Watch this awesome video on writing the CV skills section from Don Georgevich (Author, Speaker and Interview Coach) which explains exactly how to do this. This section is usually deemed as the least important part of CV writing. However, if you take this approach, you miss the opportunity to add value to your application. The hobbies and interests of a potential employee can be quite intriguing to a hiring manager. This is especially so if they have a lot of applicants for the role. When faced with such an arduous task, hobbies can bring a little light into the process. A musician could provide links to their band page or YouTube videos of live performances. Someone who paints in their spare time might like to link to a personal website with examples of their work. Another way this section can be valuable is where it shows the employer that you take an interest in your personal health. An example of this is going to the gym, which usually translates to less sick days! There can be a downside to adding this section and that’s if you list mundane hobbies, like watching movies, reading or socialising with friends on a weekend. There is nothing special or interesting about this, and could actually negatively impact your CV. Socialising at the weekends = Monday hangovers! If you are going to include your hobbies, make sure they are interesting and valuable from an employer’s perspective. Back and joint pain are the second biggest source of absences in the workplace. Hobbies that keep you fit suggest to an employer that you’ll be less likely to have sick days. Read our article to find out more: Does the hobbies & interests section of my CV matter? Does it have adequate spacing between each section? Have you used bullet points where necessary? Did you get straight to the point? Have you proofread your CV for spelling and grammatical errors? Is your chosen font the right size to read – not too big and not too small? Have you tailored your CV to the role and is it relevant? Have you correctly added headers for each section? Now that you’ve learned how to write a CV, it’s time to choose a CV template! There’s no need to spend hours trying to figure out how to create and present each section. With such a huge selection of ready made professional CV templates to choose from, we’ve done the hard work for you! Check out our CV template collection for lots to choose from.